The Wurfrahmen 40 (“launch frame 40”) was a German WW2 multiple rocket launcher. When used on the SdKfz 251 halftrack, a frame with six base plates was used, with three on each side. It formed a more mobile and protected artillery piece than the towed Nebelwerfer. It was nicknamed Stuka zu Fuss (“Stuka on Foot” or “Walking Stuka”) and Heulende Kuh (“Bellowing Cow”). Introduced in late 1940, the weapon system was a framework with adjustable base plates fitted over and alongside a vehicle which could hold 300 mm high explosive (HE) rockets; 280 mm HE and 320 mm incendiary rockets were also used, the rockets being fired while in their loading crates. Although spin stabilized, the rockets were not as accurate as conventional artillery and reloading was time consuming due to the rocket’s weight. Rockets were ripple-fired in large numbers where feasible to quickly saturate a target. The Wurfrahmen 40 was successful in service as a support weapon for the mobile Panzer formations, particularly in urban areas. 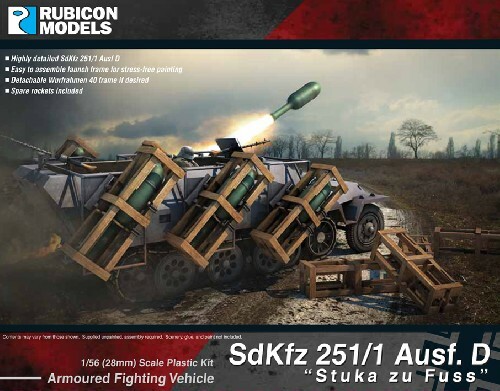 This highly detail plastic kit depicts a SdKfz 251 Ausf D with a Wurfrahmen 40 multiple rocket launcher. The Wurfrahmen 40 frame is detachable enabling you to revert the vehicle into a standard SdKfz 251/1D personnel carrier.